Alamance Community College has received a $1 million gift from global life sciences company LabCorp. The gift will be used to provide students and instructors in ACC’s Biotechnology, Medical Laboratory Technology, Histotechnology and Agricultural-Biotechnology programs with state-of-the art laboratory equipment and supplies. It also will provide for ongoing service and maintenance needs. College administrators and trustees welcomed the gift, which has already resulted in new equipment being provided for the MLT program. The parties anticipate that the largest portion of the gift will be used to outfit ACC’s planned Biotechnology and Life Science Center of Excellence facility on its Graham campus. That $9.1 million, 30,000-square-foot facility will be funded through the $39.6 million bond resolution that was approved by Alamance County last year. The partnership between Burlington-based LabCorp and ACC spans more than 30 years. The two industry partners collaborated to launch ACC’s Biotechnology program in 1985, Medical Laboratory Technology program in 1988 and Histotechnology program in 2018. 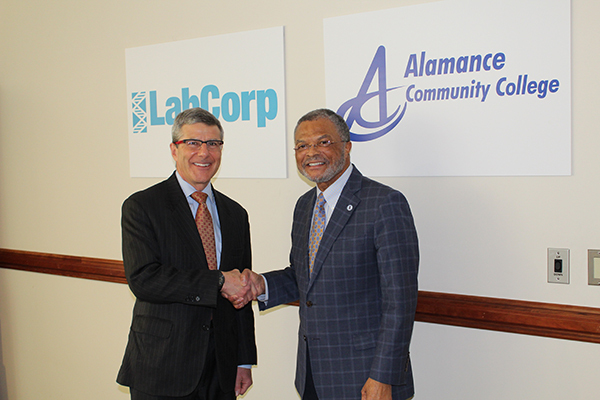 “This year marks the 50th anniversary of LabCorp’s founding in Burlington; we are proud that Alamance County has remained our headquarters, and we’re pleased to honor that commitment to the community through this gift to the college and its students,” said David P. King, chairman and CEO of LabCorp.